In 1995, as a student at the University of Texas, I came upon a writer in Austin named Marion Winik. Her essays appeared in the Austin Chronicle at the time. She had recently published a collection of essays called Telling and, not long after I discovered her, she came out with First Comes Love. I laughed or cried every time I read her. She was the first author I read who felt and sounded like a real person. She wrote often about love and heartache, which seemed inextricably woven for her at the time, and I so wanted those experiences for myself that I lapped up every word. Mostly though, I loved reading about anything in the words of a woman so genuine that I wanted to sit and visit with her over coffee for hours upon end. Marion Winik is a huge part of why I love to read and why I love to write. I learned through her writing that what I most love to read – what I respect most – is honest writing, no matter the subject. Marion Winik now lives in Baltimore. This morning, I read one of her essays in the Baltimore Fishbowl. It’s called “Little Sweetheart of the Boston Strangler.” It’s about love. It’s funny. It’s honest. If you have never read her, you should. She’s a hoot, and, though many years have passed since I first read her, I still find myself lapping up every word. I have fallen in love with Emilio Estevez all over again. As a kid, I loved him as Two-Bit in The Outsiders and as the Jock in The Breakfast Club. Tonight, I loved him in The Way, a movie he wrote and directed about a man (played by Martin Sheen) who goes to France to recover the body of his son who died while traveling the Camino de Santiago, a pilgrimage path through northern Spain. I can’t say too much because this movie needs to unfold before your eyes. But do go see it. I wish I had written this movie. I hope to live an experience like the one depicted in this film. And I hope with all my heart that I will be remembered by those I encounter as someone for whom kindness was an instinct. I’ve tried at least four times now to write the second Italy post. I want to write about the Sistine Chapel and how I thought that super famous painting of God reaching out and nearly touching fingers with Adam was the entirety of the ceiling. On my trip, I learned that that particular fresco is called “The Creation of Adam.” I also learned that “The Creation of Adam” is but a small part of the ceiling of the Sistine Chapel. A very small part. I wish I had a picture to offer of all the beauty and color in that place, both on the ceiling and all the walls, but we weren’t allowed to photograph in the Sistine Chapel. All we could do was stand quietly and look and hope to remember. I remember how it felt standing in a mass of people and being watched by security, particularly for violations of the no camera policy. I remember, under the buzz of the “silence” of the masses, wishing everyone would just go outside and leave me alone in that place for just a minute. That feels fresh to me. But just a few weeks away from my trip, I’m already forgetting the details of how it looked. I’ve even forgotten where on the ceiling “The Creation of Adam” was located. The trip, though it was mere weeks ago, feels far away. Since I’ve gotten back, I’m in the reality of work, task lists, extra pounds, divorce, death, and other heartaches of various kinds. My work is wonderful – an incredible gift in so many ways – so I don’t include that on the list to complain. But with everything going on, including the rush of getting back on top of things with my work, I feel like I’ve lost the serenity of being on the other side of the world way more quickly than I expected. Right now, I can’t imagine living out of a suitcase, eating three big meals a day, seeing something new every day, and experiencing wonder constantly. The wonder I’m experiencing is less “wow, that’s beautiful” and more “seriously, did she just do that?” I’m not asking, “Where are we heading today? Can we take pictures in there? Where should we have dinner?” Instead, I’m asking, “What should I do now? How should I handle this? Can this be fixed?” It’s just all so much…heavier. I miss the lightness of Italy terribly. I miss standing in the Sistine Chapel where the only thing on my mind was my desire for some alone time in that space, without the masses and without the security. I want so much to be looking at “The Creation of Adam” again. And if I can’t look at it, I at least don’t want the memory of it to fade quite so fast. Italy Part 1 – Seriously? Is that where we were? When we arrived in Italy, my friends and I spent an afternoon roaming Rome before we had to meet up with our tour group for the opening night dinner. We were on a tour with Globus, a company I highly recommend if you want a low stress, high quality trip. We were told we could head out on foot towards the Vatican, so we did. The first time I pulled out my camera, we were here. I got the feeling we were somewhere special, but I didn’t know details. I just thought everything, including this domed building, was beautiful and grand. The castle and bridge felt familiar, but I couldn’t quite put my finger on why. We ended up at the top of the castle where we had an amazing view of the city. The view included one of that big, beautiful and grand domed building. 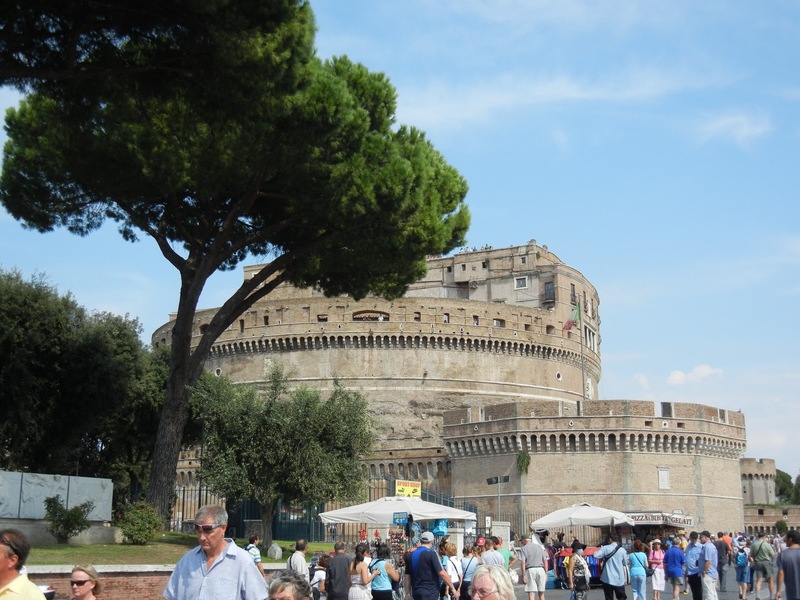 I learned the next morning on our city tour that the castle, the Castel Sant ‘Angelo, was featured in the Tom Hanks’ movie, Angels and Demons, which is why it was familiar to me. 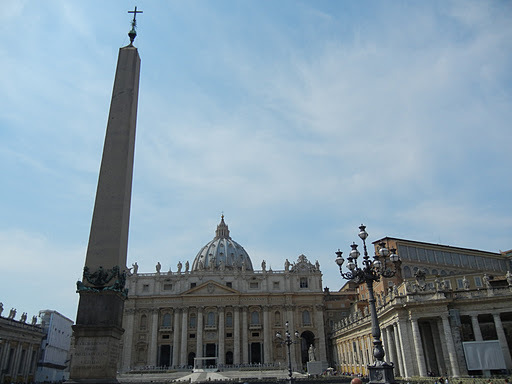 I also learned that the big domed building was St. Peter’s Basilica, the largest Christian church in the world. 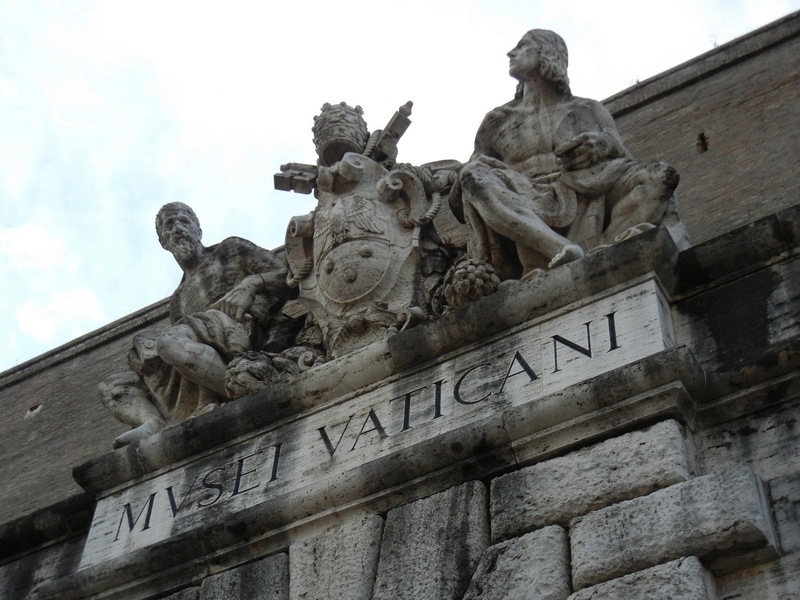 We had been in Vatican City, and I had no idea. We had stood practically within spitting distance of the Sistine Chapel, and I had no clue. 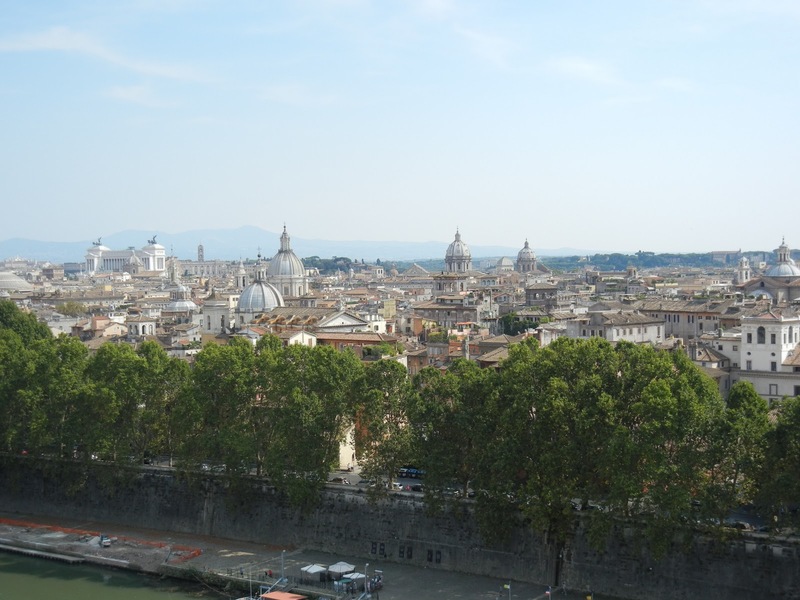 The next morning, as we ventured back towards the Vatican, and I realized where we had been the day before, I felt like a complete idiot. Though I didn’t tell anyone at the time, I was embarrassed at my own stupidity. I’d heard the term “dumber than a box of rocks.” That day, I stood convinced that the term applied to me. And there, in the midst of my unblissful ignorance, began the best schooling I’ve ever had on world history, religious history, and the arts. 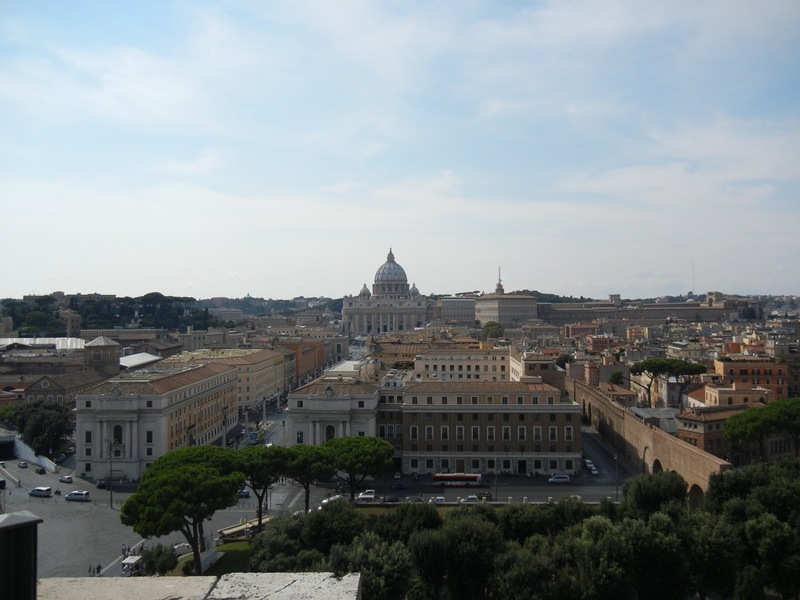 There at the Vatican, on day two of my first ever trip abroad, Michelangelo, Rafael and I became friends. Well, hello, gentleman. What an absolute pleasure to finally meet you. I took this picture this morning in Portland. 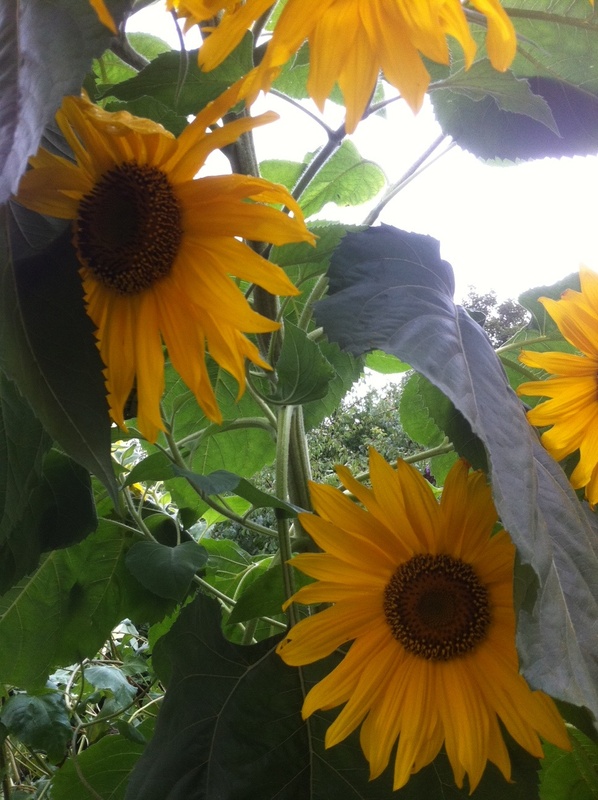 I love sunflowers. 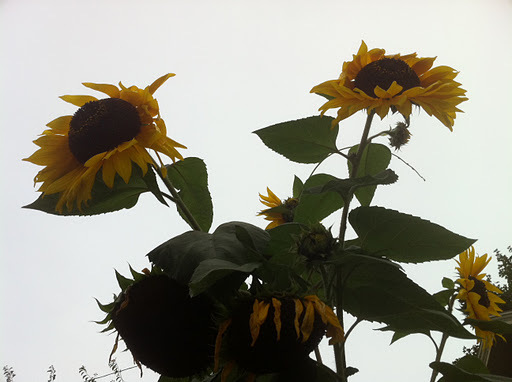 In Italy, I saw fields of what would have been sunflowers had we been there a month earlier. Though I saw only rows of hacked brown stalks, I could imagine the fields in full bloom. How stunning they must have been. I drove by dozens of fields, smiling at what had previously been there and what I knew would be there again some day. I wish I could see as clearly the beauty in people, both others and myself. Sometimes I see only hacked brown stalks, and I wonder if the beauty was ever even there. Would it return? Or is the empty field all that remains? I looked again at my first photo and realized that I was standing in shade and needed a bit more sun behind me. So I took one step to the right and tried again from a different angle. I’m back in the States. After a rough start due to strikes of air traffic controllers in Greece, I made it out of Athens. The airline had to adjust my flights a bit, but my friends and I made it back into the country late last night. I fly from Portland to Austin today, and though I am sad to see this trip end, I am ready to see my mom, love on Bread and Butter, do laundry and sleep in my own bed. I learned a great deal on this trip about the world. So much of what I saw was “familiar” in that I know I’ve studied ancient Rome and Greece in school. I know I’ve read mythology and learned about the Pantheon, the Parthenon, and the Acropolis. I have heard about Michelangelo, Rafael, da Vinci, the David, the Sistine Chapel, and the Leaning Tower of Pisa. 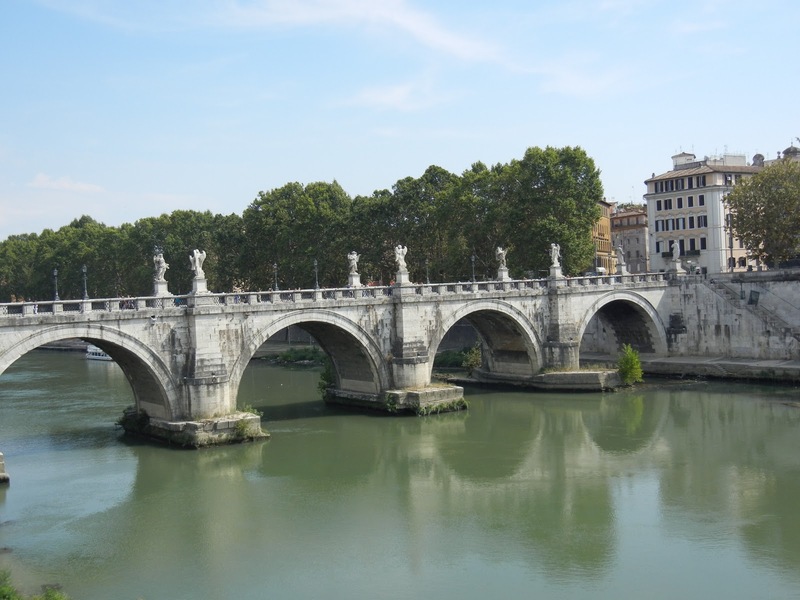 I have studied bits on the Vatican, St. Peter’s Basilica, and the various churches built to honor saints. I’m sure somewhere along the way, I was told the difference between a painting, a fresco, and a mosaic. But those things were not real to me. I didn’t care about them when I was a kid, and I learned just enough to get by on exams – to get my “A” in school. How wrong that seems to me now after having seen these places and works for myself. Looking back, I see so many missed opportunities in my education because I had such little interest in the world. I also learned a great deal about myself on this trip. I learned that I can live out of a carry-on sized suitcase for two weeks. I learned that I can disengage from email, my phone, Facebook, and Words With Friends, and the world will not end. In fact, disengaging opens up a much bigger and more rich world. I learned that I can manage my motion sickness well enough for cruises and ferries and any other type of transportation required by any journey. Mostly though, I learned that I love to travel and to read about the places I’ve been. After just over a week in Italy, we took an overnight cruise to Greece. On the ferry, there was little to do but read and write, so I dove into a book called Bella Tuscany. I had started the book on my way to Italy, but it read so differently after I experienced the traffic of Rome, saw the tiny little cars and trucks people drive there, ate countless Caprese salads, visited basilicas across the country, and walked the towns of Ferrara, Assisi, and Venice. I loved the hours on the boat that allowed me to read and relive what I had seen. I didn’t want the book to end. Now that I’m back home, I want to read more about the places I’ve seen. I welcome your suggestions for books on Italy and Greece. Art books, memoirs, history books, anything. I want to keep this trip alive and continue learning what I can. I also want to start planning the next trip. I’m starting to create a list of places I want to experience, and I intend to start working through them one at a time.